Fabulous 7 bed 4.5 bath home has been decorated with the finest furnishings and window treatments. Private pool and games room. Minutes drive away from Disney & Shopping. Every room in this fabulous 7 bed 4.5 bath home has been decorated with the finest furnishings and window treatments. Located in the resort community of Glenbrook, this enormous new home is over 3,000 square feet in living area with two separate living rooms, a large dining room and fully equipped kitchen. With three kings, one queen and six twin beds this home will comfortably accommodate fourteen. Got some gamers in your group? Enjoy your very own Playstation 2 on the 52" flat screen HDTV or challenge your friends and family to a game of pool, air hockey, foosball or darts in the converted games room. Enjoy the Florida sunshine by your very own private pool and spa with a covered lanai and patio furniture for relaxing or enjoying a meal by the pool. The location could not be better close to everything including shops, restaurants, pharmacy and Walt Disney World. Bring everyone on your next vacation and save money on hotel rooms by staying in this luxury home instead. We also have an additional superb 4 bedroom villa in Glenbrook. GBR4401. 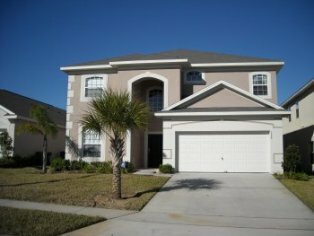 Agradecerle a FloridaBestvillas por su ayuda y buen servicio al resolver nuestras inquietudes. la casa estuvo excelente, solo que deberian modernizar un poco los baños ya que se tapaban mucho despues todo excelente!! Der Urlaub war sehr schön und erholsam. Wir haben es in der Villa genossen. Zwei Dinge fanden wir schade: 1. Nur 11 Sitzgelegen-heiten (Stühle z. B. zum gemeinsam essen) für eine 14-Personen-Villa. 2. Klimaanlage im Wohnzimmer heruntergeblasen, für empfindliche Leute zu kühl. Aber das ist ein allgemeines "Problem" in ganz Florida wo eben immer hohe Aussentemperaturen herrschen. Loved the house how ever the A/C, was not addiquate for up stairs. We had 11 family members up stairs and it was very hot. Called the next morning they sent someone out, said it was working correctly had to call again did not feel I had a complaint, the air fter we took out with totally clogged. They did agree to bring fans and see details and air technicton out and we had a good stay after that. Most lights did not have working light bulbs in them. We do change the filters every 90 days. The filters we buy are rated for 90 day use. However their job is to trap dust so if you pull a filter out after 30 days of course it will have dust on it. That will apply to any house we manage. Dust on the filter wasn’t the problem - the AC was faulty but when went over to check it the AC was running fine. we were called again and so we went back out and this time the AC was not running so we called an engineer out. He attended the same day and found that the fan motor was running intermittently so he replaced the fan motor and capacitor. If we arrive at a house and the AC is running then we’re not going to call an AC technician out. Once we were sure there was a fault he was called out. At that point we took over some fans and the problem fixed promptly. Nuestra familia esta mas que complacida con nuestra estadía en la casa! Fueron unas vacaciones perfectas y la casa estuvo genial!! EXCELENTE TODO! Bien ubicada, super cómoda y todo funcionando a la perfección. Definitivamente 100% recomendada!! Excelente servicio por parte de Florida Best Village!! Ya están mas que recomendados con todas nuestras amistades y ya estamos planeando volver!! Gracias por hacer de nuestras vacaciones familiares una estadía inolvidable!!! La villa en donde nos hospedamos nos resultó muy cómoda y conveniente, y la ayuda que recibimos ante dudas o preguntas fue siempre pronta y muy oportuna. Les recomendamos verificar un problema de goteo que tiene la refrigeradora. Quiero agradecer en nombre de toda mi familia el excelente servicio recibido de parte de Florida Best Village, ademas de reconocer la excelente casa que pusieron a nuestra disposicion, es un lugar perfecto para vacacionar, cerca de todo y en un vecindario super tranquilo. Esperamos poder volver a este lugar. El aire acondicionado estuvo malo durante toda nuestras estadia y por mas que avisamos nunca fue reparado. Tuvimos problemas con clave de acceso el primer dia ya que fue dada mal. Wir haben unseren Floridaurlaub sehr genossen und das Service rund um unsere Hausbuchung sehr geschätzt. Excelente casa, gracias por hacer de esta nuestras mejores vacaciones!!!! We rented this villa the first week of march 2013 and it was a great experience. We were a big chilean and venezuelan family party of 18 and everybody enjoyed their time at the villa (at nights and in the mornings before going to the parks). We strongly recomend it. Estuvo todo muy bien. Solo la llegada fue problemática porque los códigos de la casa que me enviaron eran incorrectos. Gracias a la empleada del Club House pudimos contactar a la gerencia y que nos pasen los códigos. Los cuales eran incorrectos nuevamente y a la siguiente vez ya fueron los correctos. Sacando ese inconveniente todo lo demás muy bien. Wir weilten eine Woche in der gebuchten Villa. Die Villa liegt in einem ruhigen Villenviertel. Störend waren am frühen Morgen die Hunde der Nachbarvilla. Pünktlich um fünf Uhr begann das Gekläffe der Minihunde. Die Villa machte einen ordentlichen Eindruck. Ein Unding waren die Bettwanzen in einem Zimmer. Wir mussten so ein Zimmer zusperren und ein Zimmer über belegen. Wir hoffen schwer, dass das betroffene Zimmer gründlich gereinigt und das Doppelbett ausgetauscht wird. Rückmeldung Georg (FBV) vielen herzlichen Dank fuer das Feedback. Haben natuerlich sofort den Inhaber befragt und alarmiert. Der aktuelle Stand ist wie folgt: Die Minihunde sind nun im Haus des Nachbarn, statt draussen, die Bettwanzen wurden erfolgreich bekaempft, das Zimmer desinfiziert und die Matratze ausgetauscht. We enjoyed staying your villa. It was very convenient and gave us a local feeling. The house I rented was the GBR 7501. I only have to say good things about this house: big, very well furnished, clean, quiet place and near the parks. We were very well treated by the manager at the moment we needed his help.